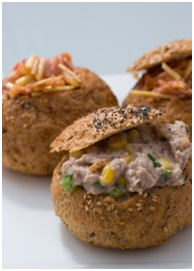 Try these healthy tasty hot food ideas. Many are suggestions from school canteens which have been popular with students and are easy to prepare. 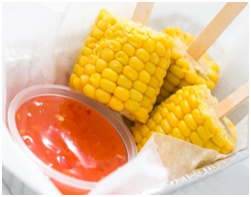 Corn on the cob: offer some toppings (e.g. sweet chilli sauce or a herby pesto). Warm roast vegetable salad: with a dollop of hummus. Pasta with tomato-based sauces: spiral or penne shaped pastas are easier to serve, and eat! Vegetable pasties: made with filo pastry (either homemade or purchased commercially). Falafel wraps: falafel mix can be purchased commercially and is quick and inexpensive to prepare. The healthiest way to make them is to bake them. Serve in a wrap with salad and sauce (e.g. tzatziki, yoghurt, garlic sauce or hummus). Oven-baked vegetable chunks or wedges: served with yoghurt or hummus dip – a great alternative to a tub of hot chips. Spinach and ricotta filo: make a bulk batch and freeze. Spinach and ricotta cannelloni: make a bulk batch and freeze. Toasties: half and whole sizes – see Hot Fillings section below for ideas. Skinless chicken drumsticks: drizzle with honey soy marinade or stir-fry sauce and bake in the oven. Warm chicken salad: mixed salad with grilled chicken or warm skinless BBQ chicken sliced across the top. Hot rolls or wraps: (e.g. roast beef and gravy with spinach). 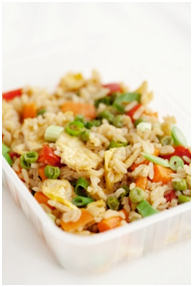 Fried rice: add plenty of diced vegetables – canned or frozen are okay to use for convenience. Burritos: Mexican-style lean mince, beans or chicken, cheese and salad wrapped in a soft burrito. Pizza: topped with plenty of vegetables (use English muffins or pita for easy individual size serves, or use regular bases). Pinwheels: scone dough rolled with filling (e.g. pizza topping or tomato chutney and cheese) then baked – serve hot or cold. Zucchini slice: a pastry-free quiche. Serve hot or cold. Make a bulk batch and freeze into serving sizes. Toasties: half and whole sizes. 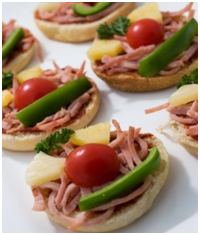 See Hot Fillings section below for ideas. Baked beans and low fat cheese. Creamed corn, reduced fat grated cheese and diced lean ham. Chilli con carne (mince and kidney beans mixture). Lean mince bolognaise sauce (try a bolognaise made with mince, tomato, garlic, onion and carrot). Tuna (canned in spring water), reduced fat grated cheese, corn and diced capsicum. Tropicana: crushed pineapple, diced lean ham, low fat grated cheese mixed together with a little tomato paste. Finely diced or grated vegetables (capsicum, carrot, corn, celery, mushrooms) combined with a sauce such as low fat mayonnaise or salsa and reduced fat grated cheese. Leftover mince, casserole or stir-fry. Low fat ricotta cheese, honey and diced dried fruit. Toasted sandwiches (use grainy or wholemeal bread). As a topping for a roast spud. Where possible, choose reduced fat, reduced salt, and/or no added sugar varieties of products. When selecting commercially made food and drink products, remember to check their nutrition information panel against the ‘Nutrient criteria for “occasionally” foods’ table in the Healthy Canteen Kit - Food Planner.